Joe Pigott's double kept Luton's slim League Two play-off chances alive with victory over second-placed Oxford. The hosts took the lead at the Kassam Stadium as Danny Hylton netted from Kemar Roofe's pass. A slip by U's keeper Benji Buchel allowed Pigott to equalise before Olly Lee's volley put the visitors ahead. 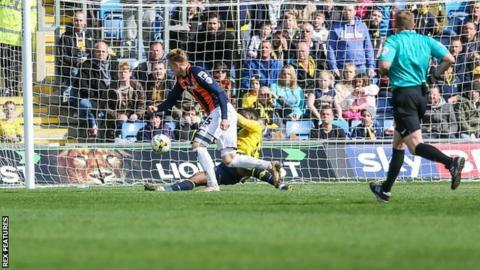 Oxford drew level when centre-half Chey Dunkley headed in Chris Maguire's free-kick but Pigott's tidy finish just gave Luton all three points. A first loss in six for the home side handed Northampton Town the League Two title, while Luton are six points adrift of seventh-placed Wimbledon - who have a game in hand - with four matches left to play. Luton Town boss Nathan Jones speaks to BBC Three Counties Radio following their 3-2 win against Oxford in League Two. "We want to be in the position that Oxford are in next year in terms of the football they are playing and the way the club is set up. "That being said I thought we were brilliant today and showed we can be like that. "We can improve Luton town. Any player who comes in can improve the team, but we need to do our homework. "Joe Piggott is one of those players that we researched, and although he has taken time to settle, he has shown what he can do today." Match ends, Oxford United 2, Luton Town 3. Second Half ends, Oxford United 2, Luton Town 3. Substitution, Luton Town. Jake Howells replaces Josh McQuoid. Foul by John Lundstram (Oxford United). Attempt missed. Liam Sercombe (Oxford United) left footed shot from outside the box is just a bit too high. Corner, Oxford United. Conceded by Glen Rea. Foul by Cheyenne Dunkley (Oxford United). Pelly Ruddock (Luton Town) wins a free kick in the defensive half. Foul by Stephen O'Donnell (Luton Town). Alex Lawless (Luton Town) wins a free kick in the attacking half. Attempt missed. Danny Hylton (Oxford United) header from the centre of the box is too high following a corner. Corner, Oxford United. Conceded by Alan Sheehan. Substitution, Luton Town. Zane Banton replaces Danny Green. Foul by Kemar Roofe (Oxford United). Attempt saved. Cheyenne Dunkley (Oxford United) right footed shot from outside the box is saved in the bottom right corner. Cheyenne Dunkley (Oxford United) wins a free kick on the right wing. Foul by Joe Pigott (Luton Town). Jordan Bowery (Oxford United) wins a free kick in the defensive half. Foul by Alex Lawless (Luton Town). Substitution, Oxford United. James Roberts replaces Chris Maguire. Jonjoe Kenny (Oxford United) is shown the yellow card for a bad foul. Hand ball by Cameron McGeehan (Luton Town). Attempt saved. Chris Maguire (Oxford United) right footed shot from outside the box is saved in the bottom left corner. Attempt saved. Liam Sercombe (Oxford United) right footed shot from outside the box is saved in the bottom left corner. Substitution, Luton Town. Cameron McGeehan replaces Olly Lee. Foul by Jordan Bowery (Oxford United). Pelly Ruddock (Luton Town) wins a free kick on the right wing. Attempt missed. John Mullins (Oxford United) left footed shot from the left side of the box is just a bit too high following a corner. Foul by Danny Green (Luton Town). Kemar Roofe (Oxford United) wins a free kick on the right wing. Substitution, Oxford United. Jordan Bowery replaces George Waring. Attempt missed. Jonjoe Kenny (Oxford United) right footed shot from outside the box is just a bit too high.